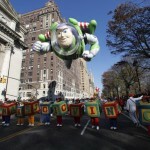 Check out some of Disney's beloved characters as floats throughout the years. 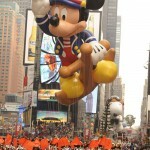 Each holiday season is marked by the Macy’s Thanksgiving Day Parade, airing this morning in time for Thanksgiving Day. Since its early versions Disney has always participated in the parade, often showcasing well-loved characters floating in the sky. In fact, this year’s parade float will be split into 3 themes – Star Wars, Disneyland 60th, and Frozen. 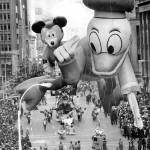 Watching the Macy’s Thanksgiving Day Parade has been part of Thanksgiving tradition for decades. I remember always watching the parade every Thanksgiving morning as a kid to see the huge floats go down the streets of New York. 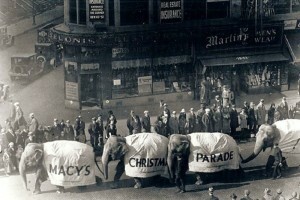 Since 1924, the parade has attracted crowds both along the parade route in New York and on the television. At first, the parade featured live animals from the Central Park Zoo, Macy’s employees dressed in costumes and small floats; it wasn’t until 1927 until the featured their first balloon float with Felix the Cat. The parade would follow a 6-mile route from Herald Square up to Harlem. Now, the Macy’s Thanksgiving Day Parade draws 3.5 million people to the streets of New York City each year, with an additional 50 million watching from the comfort of their own homes. 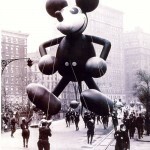 The Walt Disney Company began participating in the parade in 1934 and has continued ever since. Let’s take a look back in time to see the Disney balloon floats that have been featured in the parade. 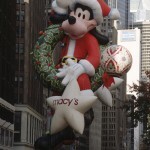 This Mickey Mouse balloon was a collaborative with Walt Disney and Tony Starg. It was hand-painted and 40 ft. tall with the Macy’s logo on his chest. Mickey Mouse and Donald Duck appeared together to celebrate the first anniversary of Walt Disney World Resort. 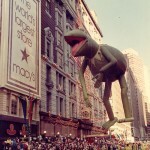 Kermit will make his way back in a second version of this float later in 2002! 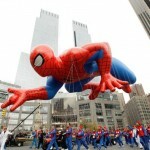 New York’s very own friendly, neighborhood superhero takes the skies over New York at 37 feet tall. Even though Marvel was its own company at the time, Spider-Man and others are now part of the Disney family. Santa Goody was one of the “new” balloons in the parade followed by 6,000 tap dancers setting the Guinness World Record for Largest Assembly of Tap Dancers. 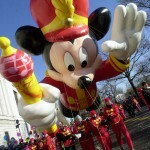 The “new” bandleader Mickey Mouse balloon lead the first parade into the new millennium. 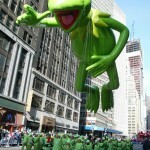 Everyone’s favorite frog returns to the streets of New York at 60 feet tall. The sky wasn’t falling for Chicken Little this time. He had the opportunity to soar down the streets for its movie release. To infinity and beyond! Pixar‘s fearless intergalactic Space Ranger debuts at 34 feet tall. Sailor Mickey sets sail on 34th Street for Disney Cruise Line. The Macy’s Thanksgiving Day Parade continues to be a magical Thanksgiving morning experience for both children and adults across the country. Don’t forget to tune in and see what floats debut this year. Happy Thanksgiving to everyone and may your day be filled with great food and great company!